These posters make Master Lee feel nostalgic, longing back to his youth when he would watch these movies with his friends in the movie theaters of Chongno in Seoul. He had almost forgotten how beautiful the poster art was in those days. And of course the huge paintings hanging above the theater’s door, advertising the movies playing. 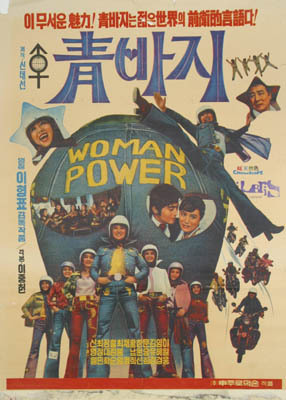 Master Lee can’t remember whether he saw the movies belonging to the posters (after all, it has been a while), but he just wanted to share the pleasure of viewing them with you. How not to link the poster for Ch’ŏngpaji 靑바지 or Blue Jeans (1974)? These girls and their demand for woman power were some 30 years earlier than the Spice Girls, and be honest, the bluejeaned beauties also look cooler and better! This one is for the movie The Gentleman From Hell (1969) 地獄에서 온 紳士.Yup, Master Lee knows how he feels, seeing that he starred in Invincible From Hell himself. And no, it’s not about Master Lee. It’s just a very nice movie about gangsters and cops. 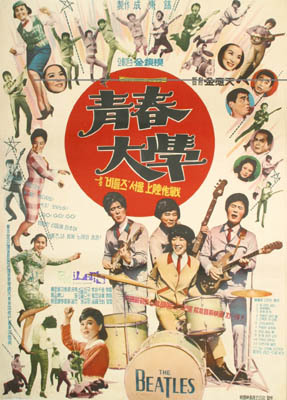 The premis of Youth College 靑春大學 (1966) is mouth-watering. Four boys win a talent show and lotsa money, but then they get kidnapped by gangsters who force them to imitate the Beatles and make money for the gangsters. In the end, of course, good prevails and the gangsters get their collective asses kicked by our musical prodigies! 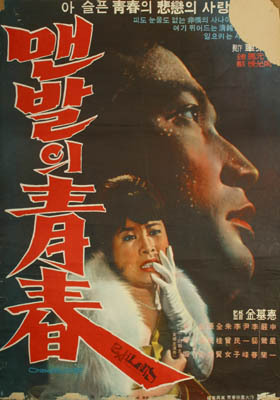 The last movie is a classic by director Kim Kidŏk, called Bare-Footed Youth 맨발의 靑春 (1964), which tells the story of the ill-fated love between a gangster and the daughter of a diplomat. Master Lee distinctly remembers the burning of his eyes (no tears of course! Do you really need to ask?) after seeing this one. 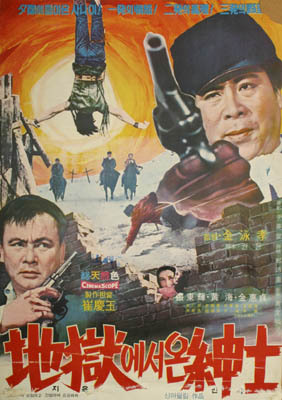 Please check out Master Lee’s review of his later Shanghai Blues (1969). Master Lee is a bit stingy when it comes to granting the masterly pulp epithet, but these posters surely and rightly deserve it. Those old vintage posters surely brings alots of my childhood memories,by the way I am in my 40’s!